-respite between shows. The road between Bryce Canyon and Escalante in Utah. Here's to New Horizons...that glimmer of hope way in the distance just between the space where the earth and atmosphere meet. With the continual movement of the sun and our yearly ritual of celebration during the darkest days of the year in the Northern Hemisphere, many of us can't help but reflect on the past. The desert colors are intense, this gorgeous cactus was preening on a hike to Calf Creek Falls in Escalante, Utah. 2014 was a busy year for me, and 2015 is no different...my calendar already has many pen marks and scratches with tentative possibilities. My studio is open the usual First Saturdays from Noon to 5, and Thursdays from 11 to 5...always noted on my website as long as I'm in town. My first workshops are already coming up in mid to late January with two out of my own studio, (see http://www.antelman.com/class-schedule/ for the full 2015 list) and then I'm off to teach for the Creative Metals Guild in Newburg, Oregon near Portland and very soon after it's up to The Ranch Center for Arts & Crafts in Snohomish, WA near Seattle for a 5-day, already filled workshop. Soon after that in mid March I'm off to the Scottsdale Arts Festival--a glorious time of year in the desert in downtown Scottsdale, Arizona. I am waiting on most of the events for the year and will post them a they come up: http://www.antelman.com/events/ and boom, it's already April...phew! Wandering the bluff in Mendocino, CA you can count on the usually diffused grey days which, like the desert, makes the colors of these wild Irises pop. Respite between shows...in Portland, Oregon there are random pianos scattered around town for anyone to play. This spot happened to also have a tiers bicycle totem. Outside at 10 Speed roasters, I wish this falafel truck was open. Then there is my work, many projects large and small, scattered on my desk and on boards with notes across work tables. Hot pink post-it notes with stick figure drawings of design ideas jotted down during last summer's show circuit are still scattered among the parts; tubing, stainless wire, model earrings, stones, and silver dust on my desk. Some ideas have come to fruition. Horizon earrings have all been sold and new parts have been set out to make them again. It's always a good sign when a new design sells out (see horizon earrings http://www.antelman.com/earrings/horizon-ears). Then there are the long-term projects that have finally been completed such as Glimmering Sunshine and The Long Horizon necklaces. Some projects call for more thinking than actual fabricating and these pieces gave me those challenges that are frustrating but really move you forward (these challenges are the focus of my workshop, Engineering Your Way Out). Finally, these two show pieces are both ready for their close-ups. I have a few more ideas I'm playing around with on my desk...and there's always more. There are more ideas in my mind than I can physically create in any given time. ...hence the hot pink post-it notes. 10 Speed Coffee Roasters in Mount Hood, Washington. There are so many beautiful places I visited in 2014 while traveling to shows and teaching, with built in respite-I even had time for hiking and hanging out in cafes. These experiences are always fulfilling and energizing. Whether it's taking in the scenery by hiking through grasslands or slick-rock, meeting local people, discovering something new, breathing in roasting coffee beans, sampling the local cuisine...and/or local beer (aka: beer brewing capital, Bend, Oregon during Art In The High Desert) ... it all contributes to broadening our horizons as we look back in the rear view mirror or forward into the distance. What's new over the horizon is filled with promise, hope, possibilities and adventure on the open road. ...and lots of rainbows. Seriously, I saw lots of rainbows during the summer craft show travel stint. 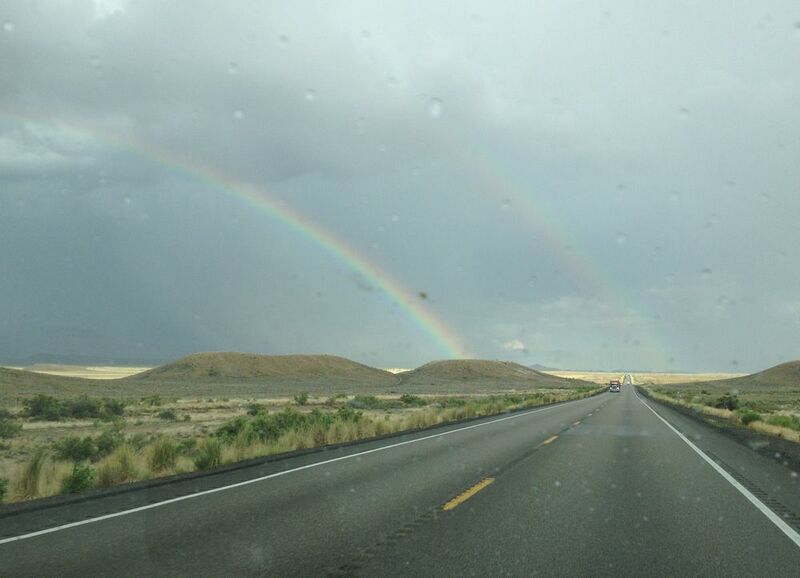 Above is a double rainbow, the second one is faint but if you look for it, it's really there. This was on a cut through road from I-15 below Salt Lake City to I-70 towards Colorado. Happy New Year: welcome 2015! !